CHELSEA — In the face of fierce opposition, Department of Education officials voted Thursday to allow a Success Academy charter school to operate out of the same building that houses the embattled High School for Graphic Communication Arts. Success Academy's K-5 school will open at 439 W. 49th St., which also houses three other specialty high schools — the Business of Sports School, the Urban Assembly Gateway School for Technology and the Alternate Learning Center. 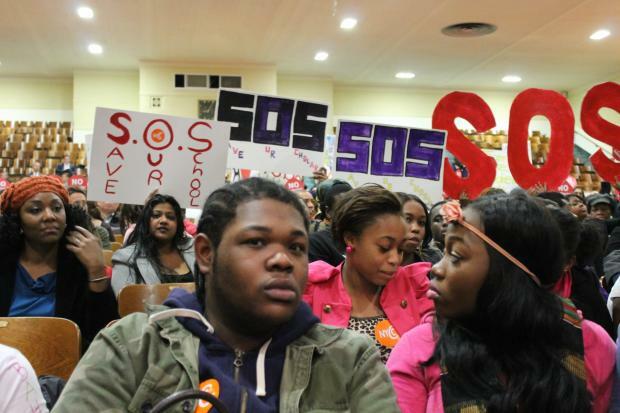 The Panel for Educational Policy approved the newest co-location at its Thursday night meeting, and also voted to give the go-ahead to five other Success Academy schools across the city, including one at the Washington Irving campus near Union Square. The Success Academy chain of charter schools has 14 locations around the city, with six more set to open next year. The school operator claims the Graphics building has hundreds of seats opening up over the coming years, and that the charter will help serve a growing population of young children as families move into the area. For years, Graphics has scored low on the DOE's school rankings, and was set to be closed down under the city's Turnaround program until an arbitrator halted that plan over the summer. Opponents of co-locating the charter school in Hell's Kitchen said it would eliminate high school seats in an already overcrowded building, and that it may be unsafe to have young elementary-school students in a building that's overwhelmingly full of high schoolers. “Mayor Bloomberg’s forced co-locations have been divisive and disruptive to students, leading to loss of access to critical programs and school facilities such as classrooms, gyms and cafeterias," said Zakiyah Ansari, spokeswoman for New Yorkers for Great Public Schools. "Under Mayor Bloomberg’s DOE charter school operators like [Success Academy founder] Eva Moskowitz, have been allowed to play by their own set of rules, while parents, teachers, students and communities are shut out of decision-making." Stefan Friedman, a spokesman for Success Charter Network, said they have found that younger students coexist well with teens in other buildings where Success Academies are paired with high schools, such as in the Upper West Side's Brandeis building. "Everybody gets along extremely well, and we expect the same in Hell's Kitchen," he said. Friedman added that Success has already received 327 applications from parents hoping to send their students to one of the two District 2 schools opening next year. Opponents of the plan included parents and students at the existing high schools, along with State Sen. Tom Duane, who previously said the co-location is an inefficient use of space that cannibalizes the existing school programs. Laurie Frey, a member of District 3's Community Education Council and a critic of the Success schools, said the Upper West Side charters in her district often steal valuable administrative and lab space, even if the building does have free seats. "If they do that in a high school like Graphics, it will push their administration rooms offline," she said. "It happened at Brandeis. The administrative rooms were converted to classrooms."